Maia Drazhar is eighteen years old: the fourth, last, least-loved, half-goblin son of Varenechibel IV, the Emperor of Elves, and his now-dead fourth wife, Chenelo. Despised by his father, abandoned by the court, and left in the decidedly untender care of his disgraced cousin, Setheris, no one ever expected Maia to inherit the throne, least of all Maia himself. But when the airship Wisdom of Choharo crashes and burns, killing not only her entire crew, but the Emperor and his three eldest sons, this is exactly what happens. Thrust into a position he was never taught to hold, surrounded by scheming nobles and conniving bureaucrats, and forced to navigate the internecine feuds of elvish politics without guidance or sympathy, Maia must scramble to overcome his abusive upbringing and learn to rule—fast. Because the Wisdom of Choharo didn't crash by accident, and whoever assassinated his father may want Maia dead, too. No matter how voraciously or widely we read, it can still be hard to articulate the exquisite sensation of finding a book that grabs us; whose narrative causes us to lose all sense of time—of our bodies, even—and stay up reading longer than the morning's commitments make sensible. It's a bit like being in love, in that sense: even when we know we ought to be doing something else, that the story will still be waiting for us if we step away for an hour or two, it doesn't seem to matter—we pine, distracted and eager, as in the earliest, deepest stages of infatuation, conducting a whirlwind romance that starts with a word and ends with the rosy afterglow of the last page turned. This is the deepest magic of stories, and its most important: the conjuration of an empathy so pure, it all but tumbles us out of our skins and into someone else's. The Goblin Emperor is such a book. Combining elegant prose, intricate worldbuilding, compelling politics and, in the figure of Maia, a poignantly sympathetic protagonist, its appeal is nonetheless as much thematic as structural. As a genre with its roots in, but not necessarily beholden to, the glory of colonial empire, steampunk tends to come in one of two flavors: stories that interrogate the socio-political aspects of conquest, industrialization, and cultural upheaval, and those which merely borrow the manners and aesthetics which overlay them. 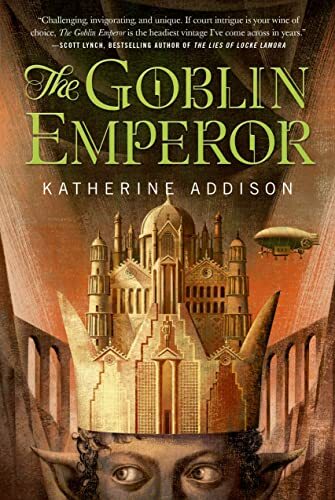 The Goblin Emperor is firmly the former sort, marrying the social change and new technologies of steampunk with the imperial trappings of high fantasy—elves, goblins, magic—to impressive effect. As such, and in addition to being a compelling novel of character and politics, The Goblin Emperor also addresses issues of race, class, gender, and sexuality in subtle but important ways. Maia is a half-goblin in an elvish court, and though he often feels self-conscious about his distinctive grey skin, Addison's characterization of him is richer and more complex than the simplistic crisis of identity often prescribed for biracial characters. Maia doesn't angst about whether he's "really" elvish or goblin, or fret about what it means to be both; neither does he have any special powers or crippling weaknesses as a result of his heritage. Rather, in a court obsessed with appearances, and whose previous emperor disdained public worship, he worries about how to express the faith his mother taught him without becoming the subject of gossip, and—at the same time—how to remedy his ignorance of goblin custom and language, which his father forbade him to learn. It's also noteworthy—and important, given that Addison has otherwise adhered to the traditional split of white elves and dark goblins—that the two cultures are equally well developed, equally powerful, and possessed of a long, shared history; Maia is far from being the only biracial resident of the palace, and those others he encounters occupy a wide range of stations. Though the elves often snub the goblins as ugly, and while Addison still uses this as a lens through which to address, however fleetingly, the subject of skin color politics, the narrative also makes plain that the issue is more involved than this, particularly as regards the broken relationship between Maia's parents. Though Varenechibel disdained Chenelo's looks, the marriage ultimately failed not because of her heritage, but because it was a poorly timed political match: the emperor's previous and much-loved wife had only recently died in childbirth, delivered of a stillborn child, when his ministers forced the pairing with Chenelo. Maia was not meant to happen, and rather than live with a fourth wife and child he didn't want, and whose presence was a sour reminder of what he'd lost, Varenechibel set them both aside; a cruelty in keeping with his character, but not wholly—or even mostly—racially motivated. "If you did not marry. What would you do instead?" "We thank you, Serenity, but we do not expect you to be interested in our foolish, daydreaming ambitions." It was the most words he'd gotten out of her at one time . . .
She gave him a bitter look when she realised he would neither speak until she did nor dismiss her from his presence, then said in a small, defiant voice, an unexpected hint of what she would have been like as a child, "We would study the stars." "Yes, Serenity," she said, and it suddenly struck him as ludicrous and demeaning that a woman of twenty-eight should be subject to the judgement of a half brother ten years younger than herself. He said, "Then you should."
. . . It was Vedero who squared her shoulders and said, "Serenity, you need our marriage." "But if it is not what you wish . . ."
"Serenity, your bargaining position is weak enough as it is. You cannot afford to wait until Ino and Mirean are of age." "But with whom are we bargaining?" All this being so, it would be easy—and not wholly inaccurate—to characterize The Goblin Emperor as a novel about the need for social change as seen through the eyes of someone both able and minded to effect it at the highest levels, despite the conservative obstacles he encounters. But as much as these themes are constant throughout the narrative—asides about a sister's wife in another country; about a nobleman bringing his male, baseborn lover to a public ball; about the misuse of workers in the empire's factories; about the deliberate, continued elision of once-poor but now steadily self-educating communities for the sake of preserving traditional trading monopolies; about ministerial incomprehension of new and vital technology—they are not its primary focus. Instead, The Goblin Emperor is a novel about abuse and power; about the systematic relationship between these two things, and about the persistently personal nature of the political. From the outset, it's clear that Maia has been cruelly used by Setheris, with whom he's lived for a decade. Accustomed not only to verbal and physical abuse, but to the capricious restriction of his freedom, Maia is undersocialized, self-critical, and afraid of conflict. He is also intelligent, compassionate and, though he doesn't realize it, brave—qualities that all steadily come to the fore as he starts to find his footing. But in a narrative about an abused boy unexpectedly becoming emperor, it's crucial to note that what gives Maia the strength and courage to take control isn't the power of his position, but the safety it affords him—not in terms of removing him from all and every danger (as he has many political enemies), but in the most basic sense of his being protected from casual aggression. When older men seek to intimidate him physically, whether by speaking loudly, advancing towards him or otherwise encroaching on his personal space, Maia is able to draw on the fact that, as emperor, he is physically inviolate: unlike Setheris, they cannot hit him, nor will his cousin ever hurt him again. But abuse comes in many forms, and abuse of power is rife in the capital, not just at the level of cultural oppression, such as is used to control women, but in the sense of abuse of dignity, and denial of humanity. Maia is protected against the form of violence he most fears, but is bound in turn by the tightly policed strictures of what an emperor should and should not do; strictures enforced by his bodyguards, secretary, and bureaucrats as well as the expectations of his court and subjects. Aware that he cannot step outside his status without causing more distress to others, Maia instead finds acceptable ways to express his compassion, using the system that uplifted him to uplift others in turn—subverting his own power by sharing its benefits and thereby, paradoxically but naturally, making himself stronger. These small but meaningful acts of kindness—apologies that an emperor ostensibly need not offer; consideration for those less powerful; the extension of mercy—are what ultimately win him his allies, even as they put him at odds with those who confuse his kindness with weakness. Apologizing for a display of bad temper should not be a radical act; should not have the effect of startling, frightening, or confusing the person to whom that apology is offered. Yet this is what happens, time and again, as a result of Maia's actions, the systematic nature of oppression laid bare by the reactions of those accustomed, not to abuse of power, but abuse through power, abuse as the native mechanism of power. Just as Maia has been abused by Setheris, so too, in a very real sense, have many of his underlings been abused by a system that places them at the mercy of petty tyrants, or which natively elides their humanity and importance. Just as Maia first flinches from, and is then undone by, the unexpected kindness of strangers, so too do those strangers first flinch from, and are then undone by, the unexpected kindness of Maia. In different but interconnected ways, they are all products of the same abusive system—that of hierarchy, patriarchy, and political expedience—and even though Maia's scars, both bodily and psychic, are largely attributable to the actions of a single person, that he was forced into receiving them was itself an act of that system, and of his father's abuse of it. It is no coincidence, then, that the book begins with the death of wisdom—the crash of the Wisdom of Choharo —and ends with its rebirth, in the planned construction of the Wisdom Bridge, named in honor of the downed airship: a neat bookending of destruction and creation that exemplifies Maia's use of power in the service of others. In traditional high fantasy, the archetypal Good King wins out in a moment of deep catharsis, triumphing over obvious evils to claim the birthright exemplified and proven by his chivalrous qualities. In The Goblin Emperor , Maia becomes a Good King—or a good emperor, rather—in precisely the opposite fashion, and to much greater effect. Despite several dramatic events, there is no single dramatic catharsis: just the steady business of wounds healing, progress being made, and formerly lonely, alienated people being made whole by the trust they come to have in each other. Maia's chivalric virtues, if we can call them that, stem from the fact that he doesn't believe himself to be inherently worthy. He earns the throne, not because of who he is, but because of who he strives to be, while the evil he defeats isn't personified as a hoard of devils or a cackling overlord, but by the more insidious cruelties of abuse, entitlement, pride, and callousness. The Goblin Emperor is a powerful, poignant book, and an excellent addition to the genre. I enjoyed every minute of it. Foz Meadows is a bipedal mammal with delusions of immortality and sometime fantasy writer. She blogs about tropes, pop culture, feminism, politics, and SFF at her website, Shattersnipe, and is a contributing writer for The Huffington Post. She is also the author of two YA urban fantasy novels, Solace & Grief and The Key to Starveldt . Foz Meadows is a genderqueer author, blogger, reviewer, poet, three-time Hugo nominee for Best Fan Writer, and winner of the Norma K Hemming Award. Her most recent novels, An Accident of Stars and A Tyranny of Queens, are available from Angry Robot Books. Though Australian, she currently lives in California.